GoodReads Summary: Holy unanticipated occurrences! A cynic meets an unlikely superhero in a genre-breaking new novel by master storyteller Kate DiCamillo. It begins, as the best superhero stories do, with a tragic accident that has unexpected consequences. The squirrel never saw the vacuum cleaner coming, but self-described cynic Flora Belle Buckman, who has read every issue of the comic book Terrible Things Can Happen to You!, is the just the right person to step in and save him. What I Think: I adore this book. I loved it as I was listening to it but now that I'm looking through it again and returning to the characters and Kate's great writing, I'm in love all over again. I'm going to reread it and see if Peanut wants to read it with me because it's great. I remember loving the description of Flora's mom as a writer. I wonder if Kate sees any of herself in Flora's mother and know that there are some times when I get consumed in my own writing and might act like her...for good or bad. If you've read any of Kate's books, you know how wonderful she is with words. Her writing is the kind of writing that begs to be soaked up. It naturally seeps into your skin and resonates through you. I love her description and how she looks at sometimes ordinary - and other times not-so-ordinary - people and places and situations and grasps them with her words. There have been a few writing prompts this summer with Teachers Write that encourage us to think about small moments and expanding them, to describe one moment, to zoom in on a person. 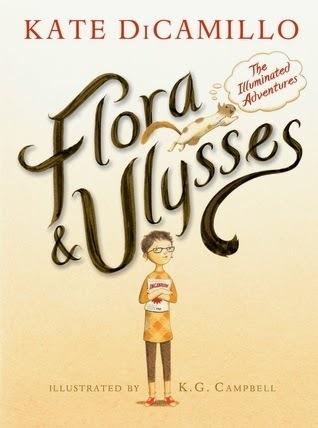 Kate DiCamillo's writing in Flora and Ulysses is a great mentor text for these activities. I especially think it's great to imagine what you might see happening in the book if it wasn't for Kate's description. You might see a girl and a mom and a boy next door, but Kate brings them to life when she tells their stories. I love working with students on show don't tell. I remember show don't tell well from my days as a student in writing workshop in junior high and high school. After understanding the writing is a process and that thanks to the process we can write and work on our writing, I believe show don't tell is the next message students need to hear. In discussing show don't tell, it's obvious how influential mentor texts are and how reading has to be part of writing. The job of a writer is to help a reader be able to visualize his or her words. As a reader, if we can visualize what an author has described, then the author has done his or her job. And the author has lots of tools he uses to help the reader visualize. Enter literary elements or figurative language. "It was astonishing. Everything was astonishing. The setting sun was illuminating each blade of grass. It was reflecting off the girl's glasses, making a halo of light around the girl's round head, setting the whole world on fire. Writing Prompts: Write about one little thing or one small moment but look at Kate DiCamillo's writing and see if you can describe using your five senses and $100 words like she does to make it feel larger than life.